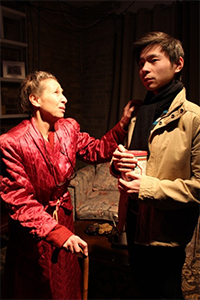 The play A Life Beyond Doubt by Tomorrow’s Eve Theatre separates the cozy Sterling Studio Theatre into three sections. Each section is a room in a different character’s house, and each section is haunted by a different ghost. A Life Beyond Doubt is not a thriller or horror, but the presence of ghosts is palpable in each scene. The first scene begins with Elizabeth talking to her Mum while shoving books into cardboard boxes. Elizabeth, played by Janna Erichson, talks to her Mum like any disgruntled daughter, rolling her eyes and defiantly using the term “mother” instead of “mum”. Mum, played by Reva Lawry, responds by lecturing Elizabeth about her marriage. It all unrolls like a scenario that has been repeated for the characters, probably in the same room with the same retorts. And then, it shifts into something deeper. Mum tries to comfort her daughter with a touch, but her hand can’t make contact. And then it slowly dawns on me that Elizabeth’s mother is not being dramatic. She can’t make physical contact because she is not of the physical word. Either she is a ghost, haunting her old home or she is a figment of her daughter’s imagination used to overcome grief. The moment tugs at the most vulnerable part of me, knowing how it feels to forget that someone is has passed on. Whether it is from habit or denial, we expect our loved ones to stay with us. The idea of love lost is shown in several ways with different characters. Elizabeth loses her Mum, Kevin and Mickey lost their own mother, Tom lost his wife, and Marge lost her daughter and grandson to distance as opposed to death. Each one of them is trying their best to deal with the missing person in their life, but the best example is with Elizabeth’s Mum. Elizabeth’s Mum does not mourn her own death, but the loss of her ex-husband. She does not need to say it. She shows her longing when she dances yearningly across a room with his old suit jacket. In the brief moment you can sense her love, her heartbreak, and her nostalgia for the times that he was not just simply alive, but her loving husband. Reva Lawry brings so much to the play with such subtle actions. Even when the other characters’ stories are capturing the audience’s attention, she does not hide away from the stage. She sits in the same chair in her room throughout the whole play. She is always in the corner of our eye, as if to say the ghost of our loved ones are present no matter where we are. Another actor who truly seemed to grasp the depth of their character’s grief was Mishka Thebaud who played Mickey, the cooler older brother. Mishka skillfully portrayed a seemingly care-free older brother break down his walls and reveal the pain of having lost a mother in a genuine way. For a small scene I watched as he shook off his macho person to reveal he was the most broken over his mother’s death. He was too young to deal with such a tragedy, but was old enough to understand the impact emotionally. Mickey told his father about the day his mother died through his own eyes, as if he had never said it before. He spoke softly and cried silently, but the emotion behind it made Mickey seem like he wanted to yell and run away. I choked up watching him display his hurt, but still try to keep face, as if getting too upset about your mother’s death was embarrassing. I recently lost a loved one, so this play spoke to me in a way I didn’t expect. Many of the portrayals of grief felt achingly real. There were a few flaws with the plays execution, like the portrayal of Kevin felt too childish for a fourteen-year old and the ending was drawn out too long, but the underlying message that loss follows us across time and space is done with great care. A Life Beyond Doubt has completed their run. However, there’s plenty more happening at Sterling Studio Theatre including Copy starting March 18th and Cowboy Mouth starting March 24th. Photo of Shel Goldstein and Michael Man by Martin Teasdale.